31 x 45 ¾ in. 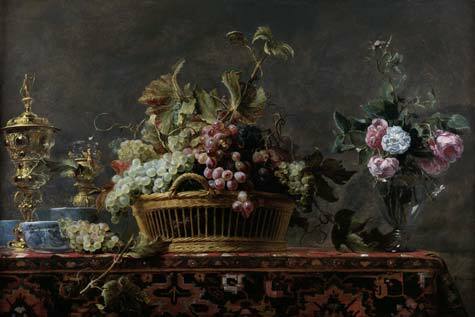 The popularity of still life scenes in the Netherlands during the 17th century can be partially attributed to the growing merchant class, who sought decorative paintings for their homes. Many still lifes, however, feature religious or moral undertones. This work by Frans Snyders is no exception. Known as a memento mori, or reminder of death, this painting includes objects with multiple meanings. The highly-detailed cut flowers could represent Dutch prosperity as well as the ephemeral nature of life. On the golden chalice at left, the knight may reference “the Christian soldier” while the porcelain bowls nearby highlight trade with Asia. Grapes commonly symbolize the wine from the Eucharist and, therefore, Christ’s blood.